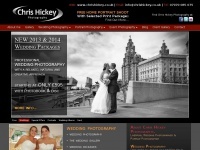 Liverpool wedding photographer produces stunning Wedding Photography in Merseyside, Cheshire & surrounding areas. Weddings, Family Portraits & Events. 7. Devonshi­re Hou­se Ho­tel Li­ver­pool /gal­lery/wed­ding-venues/devonshi­re-house-hotel-li­ver­pool..
10. 30 Ja­mes Street Li­ver­pool /gal­lery/wed­ding-venues/wed­ding-pho­tog­raphy-at-30-james-..
three profiles were found for Chrishickey.co.uk in social networks. Among other social networks the website is represented in Facebook, Twitter and YouTube. The web server used by Chrishickey.co.uk is run by EUKHOST Ltd and located in Great Britain. The website Chrishickey.co.uk has a own web server. The web server only runs this website. The websites of Chrishickey.co.uk are hosted by a Apache server and were developed in the programming language PHP. The content management system WordPress in the version 4.9.1 is used. The HTML pages were created with the latest standard HTML 5. The website does not specify details about the inclusion of its content in search engines. For this reason the content will be included by search engines.